I seriously think Mark (and me?) should hold a workshop series next year and incorporate it with Beth Marshall's "Yapinars" (which I think is a fancy word for Unconference). This post originally appeared on Blogging Fringe and is in relation to that community site in particular, but I think it also applies to any community-driven site I will ever try to build. OK, so I realised some time today that I alone cannot make all the videos, take all the pictures, do all the blog posts I want to do AND update the MySpace AND write reviews - I think I have 4 or more reviews I want to do, and they might never get the level of attention I think they deserve. Nice name, but why can't I buy Fringe tickets? Let me start off by saying that it is so utterly amazing that Central Florida has groups with funding who can do stuff like this, and we wouldn't be where we are now without CFACA and UA. Love ya, mean it. Read more about Nice name, but why can't I buy Fringe tickets? This weekend has been a wee bit crazy. 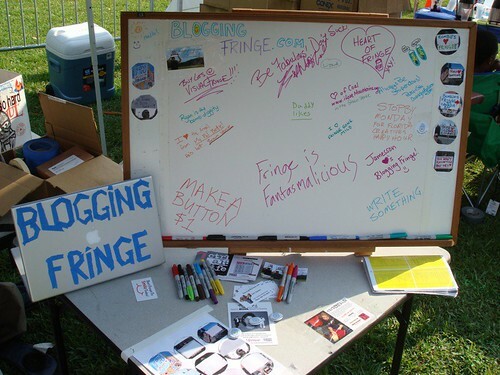 I've been updating Blogging Fringe like a crazy person. No, really. There are almost 80 shows in the festival this year, and I've been attempting to copy and paste several lines of text for each one. I've also got Denna, Kate, Jamie and Emily volunteering to help out. Of course everyone is welcome. Earlier this week, I lost 3 months worth of email, to a problem as-of-yet undiagnosed. I had been meaning to get things moved over to our CervoSites hosting (it is our hosting reseller plan), but I was worried the transition wouldn't be smooth... like maybe I would lose all my email! I am now on the new server and email is running again, but if you sent any important email to you'll have to send it again, I don't have it. I am realizing a bit too late that if you have a monthly event, you need to standardize the date. Any other dates/times/locations will inevitably be bonus events. This month's Florida Creatives is in a different place on a different day - never again. How does 3rd Monday at Crooked Bayou sound? We can build a relationship with that place, they seemed to like having us on a slow night. This means the next event is March 19th, right after St. Patty's Day.